After nearly 50 years of patiently seeking out every new poetry publication, the University of Arizona amassed one of the finest collections of Contemporary Poetry in America. With collection in hand, the University set out to design its new home; a facility for archiving, research, reading, teaching, and contemplation. During discussions defining the new facility, it became clear that there were a number of contradictions in the architectural program; the desire to provide a place suitable for active discourse as well as quiet solitude; the ability to enjoy reading in natural light while at the same time offering protection from its destructive nature; intimacy with the books and the reality of the massive presence of 50,000 shelved volumes; and, of course, the desire for security while at the same time making the poetry readily accessible to all who desired to partake. These contradictions inherent with combining a valuable collection with an active university and community resource drove the design concept. 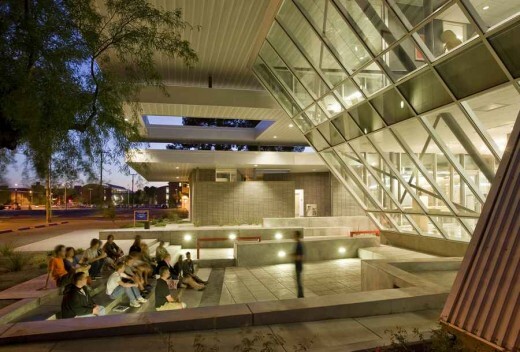 The connection between reader and poetry are overarching in the Poetry Center’s design and is refined in the plan of the building which is conceived as a “progression towards solitude.” Progression starts at the west with an active and noisy Humanities Seminar Room whose transparent walls can be opened, allowing flexibility within the shaded transition space, and doubling the seating capacity for larger events. 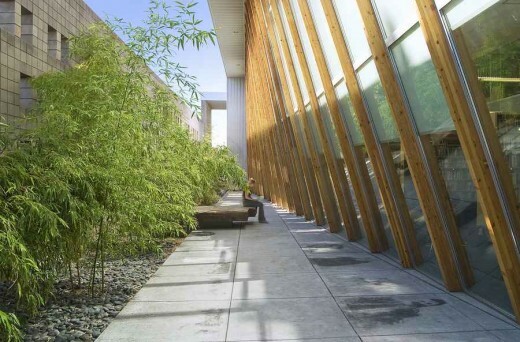 Moving east, public functions dissolve into more intimate spaces within the collection — one finds themselves in the bamboo garden, an outdoor area of solitude and contemplation. Measures were taken to create a space that was inviting to both the academic community and the public. 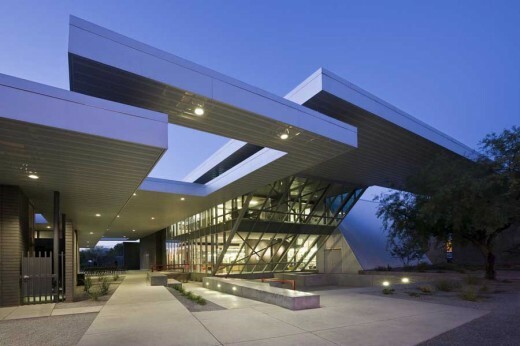 The shaded transition space welcomes visitors to the building while protecting them from direct sun with a series of roof planes that provide a transition from the hot desert climate to the cool air-conditioned interior. 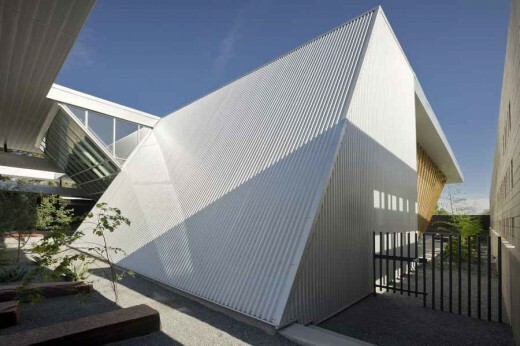 “Sky Holes” puncture the roof to further mediate the transition from the bright exterior to the shaded interior. Additionally, a recessed odeum, or small performance theater, is situated under this transition space, and is designed to be usable year-round providing shade in the summer and warming sun in the winter. The building is oriented so that southern windows are protected by overhangs which allow daylight into the spaces with no direct sun. The west elevation has minimal fenestrations, providing privacy and a barrier from traffic noise, in addition to mitigating direct solar heat gain which reduces demand on the mechanical system. On the east, a “binary wall” shades the building and bamboo garden while celebrating a line from a Richard Shelton poem (“…you shall learn the art of silence.”) with holes punched out in binary code.